ComforTone Colon Cleanse Supplement allows you to colon cleanse naturally. It contains essential oils and herbal cleansing ingredients. I like to interchange ComforTone with ICP. Along with Life 9 probiotic supplement, you can support the health of your digestive system by eliminating residues from the colon and enhancing its natural ability to function optimally*. ComfortTone also supports normal peristalsis (the wave-like contractions that move food through the intestines), and therefore strengthens systems that delivers nutrients to the rest of the body*. It also contains ingredients that are beneficial to liver, gall bladder, and stomach health*. ComforTone has eight essential oils including German Chamomile, Ocotea, Peppermint and Tangerine. Ocotea and Tangerine. Read below about the oils that are in this product. I love that ComforTone Colon Cleanse Supplement contains essential oils. Oils support detoxification and a healthy digestive system; and of course have all the other benefits of essential oils. This is an easy reference guide for ComforTone Colon Cleanse Supplement. It will tell you how to use it and what to use it for! Want to Purchase Comfortone Colon Cleanse Supplement? To purchase this product, go to The Oil Shop! 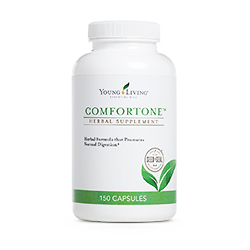 What is in ComforTone Colon Cleanse Supplement? There are several natural ingredients as well as eight essential oils in ComforTone. Cascara Sagrada Powder Bark (Frangula purshiana) – Helps to supports normal peristalsis (moves food through the colon) and aid in elimination*. Psyllium Seed Husks Powder (Plantago ovata) – Is a gentle form of ground psyllium that expands when mixed with water. It supports the digestive system by providing fiber*. Barberry Bark (Berberis vulgaris) – Supports healthy digestion and healthy liver function*. Burdock Root (Arctium lappa) – Traditionally use for liver cleansing, supports healthy liver function*. Garlic Bulb (Allium sativum) – Supports healthy digestion, it also may support a healthy immune system*. Echinacea Root (E. purpurea) – Supports healthy immune system*. Bentonite – An intestinal cleansing agent*. Diatomaceous Earth - An intestinal cleansing agent*. Ginger root (Zingiber officinale) – is supportive to a healthy digestive system*. Chamomile Flower Extract (Matricaria recutita) – Soothes and calms– see more below. Apple pectin (Malus pumila) – Supports healthy digestive function*. Licorice Root (Glycyrrhiza glabra) – Supports healthy endocrine and digestive systems*. Cayenne Pepper Fruit (Capsicum annuum) – May support healthy digestion*. Silica – Valuable trace mineral important to promoting healthy hair, nails and bones*. The essential oils that are contained in ComforTone are listed below along with a brief description of the oil. Ocotea Essential Oil (Ocotea quixos) is a unique therapeutic grade oil that helps aid the body's natural response to irritation*; and is from the cinnamon family. Ocotea also has natural cleansing and purifying properties. Rosemary Essential Oil (Rosmarinus officinalis CT cineol) was one of the most broadly used plants throughout the ages. Supports a healthy lifestyle regimen and overall well-being. This oil provides a savory addition to many meats marinades, side dishes, and dressings. Rosemary includes the naturally occurring constituents eucalyptol and alpha-pinene. Ginger Essential Oil (Zingiber officinale) is supportive of the digestive system, ginger is commonly used to soothe, comfort, and balance digestive discomfort*. Spicy and warm. Tarragon Essential Oil (Artemisia dracunculus) it is supportive to the digestive system and used topically in Europe as a digestive aid*. Tangerine Essential Oil (Citrus reticulata) The Tarragon Plant and Essential Oil It is supportive to the digestive system and supports overall wellness*. German Chamomile (Matricaria recutita)made from german chamomile flowers contains chamazulene, a compound studied for its ability to support the body’s natural response to irritation*. It clears the mind and creates patience and peace. What are the Documented Uses for ComforTone Colon Cleanse Supplement? Cleansing of the large intestine or colon by enhancing its natural ability to function optimally. Supports normal peristalsis and bowel movement function. Supports liver, gallbladder and stomach support. Take 1-2 capsules before breakfast and bedtime. Drink plenty of water throughout the day for best results. Use daily for 8 weeks this discontinue for 2-4 weeks before resuming. Can this product be used for Animals? Yes, in very, very small amounts. What are the Safety Precautions? This product contains Cascara sagrada bark. Read and follow directions carefully. Women who are pregnant or nursing and others who have a medical condition should not use this product except under the direction of a physician. Children under 12 should not use this product. Discontinue use and consult a physician if you have or develop abdominal pain, diarrhea, nausea, or vomiting. Do not exceed recommended dosage. Not for long term use. Not to be used as a weight loss product.